Hide deals from seller "Wiggle Wiggle Dog Grooming"
Hide deals from category "Pet Groomers"
Limit 1 per person. Valid on any services excluding de-skunking. Full value of Gift Certificate must be redeemed in 1 visit. 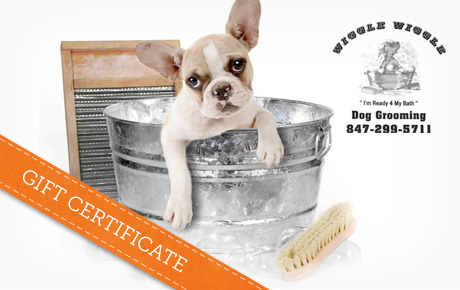 Get your pooch squeaky clean with 50% off a $20 Gift Certificate to Wiggle Wiggle Dog Grooming in Des Plaines. Each visit starts with a consultation to discuss your pet’s styling needs. Wiggle Wiggle Dog Grooming offers professional, knowledgeable and compassionate grooming for all dog breeds. The friendly and talented groomers focus on the health and happiness of each dog. They offer comprehensive grooming packages to make sure your pup is freshly washed and neatly trimmed. Wiggle Wiggle also offers nail trimming, ear cleaning, tear stain removal and more (de-skunking excluded). Keep your dog looking and feeling his best with this tail-wagging deal. Dog groomer in Des Plaines offering professional grooming packages for all breeds.